Sale season is now going full steam ahead with more and more stores marking down their Spring Summer 2012 merchandise. But to pick the best deals... be like me and start looking out for deals online. Not only do you avoid blatant markups from local stores, but the range of brands you can find are limit only by your online resourcefulness. I know some might prefer the brick and mortar shops where you can try sizes and inspect the goods physically. But if you have been loyal to a certain brands, then you will understand their measurements and give you a good idea on sizing and quality. However, if all else fails, go to the stores to have a look at the real thing, compare pricing and try them on to make a better decision. But generally, online shopping is as pleasurable if not more addictive then actual shopping. I love paying European prices and during sales, the markdowns from international sites are always much more generous than Singapore retailers. So are you convinced you need the sandals yet? I do! 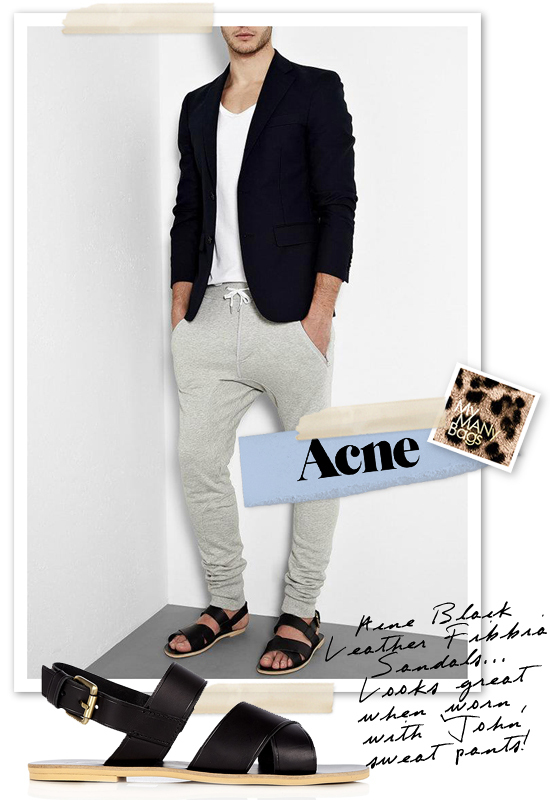 More pics of Acne's Fibbia Leather Sandals and modelling pics on my facebook fanpage. 'LIKE' my fanpage if you enjoy reading this post.